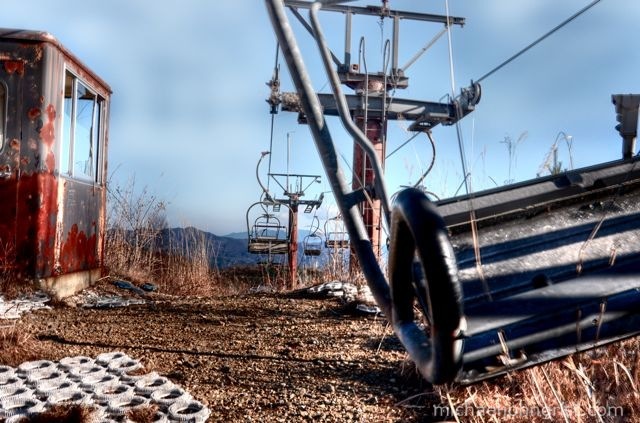 The Gunma ski lift was the glace cherry on a sumptuous cake of weekend haikyo. We’d headed up into the northernmost quadrant of Gunma seeking a mine/factory, one of the last few within a reasonable drive of Tokyo. The mine itself turned out to be not all I’d hoped for, mostly demolished and overgrown, but the ski lift and adjoining recently abandoned ski resort were a wonderful consolation prize. 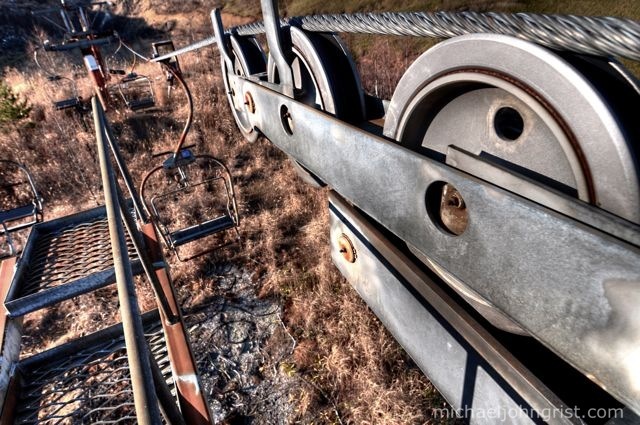 Bones of a ski lift, neglected. This was the final haikyo of a Gunma haikyo weekend blast, another being the peaceful motor lodge I posted about last week. We rolled up in the early afternoon but immediately got side-tracked from seeking out the mine by the huge ski resort plonked right beside the car park, its ski lifts racing up the hill over two narrow gelendes. I say racing, but of course they weren’t moving. Immediately we suspected it was abandoned; the car park was in a real state of disrepair, and the building itself, a giant restaurant/hotel/ski school, had clearly seen better days. We got out and wandered about the outside, wondering if the guys toying with a remote control helicopter in the car park over would give us some hassle, but they didn’t. The complex proved to be open at the ski school side, one of those delightful cases where there is no apparent access, holes have been put through the reinforced windows seemingly in vain before you, but one of the sliding doors slides easily open. We were in. I didn’t take out my camera because there wasn’t much need- the place looked much as it would have done the day it closed (though the most recent calendars dated it as closing around 2001). Ski boots, skis, ski sticks were laying around in neatish lines. The office had been mildly ransacked. Lockers hung open. The gift shop had been partly trashed. It was fairly characterless and impersonal, like an airplane departure gate, but still fun to romp around in. I picked up some ski sticks (shock horror! vandal!) and wandered about. I rifled through some drawers (thief! burglar!) and picked out some name badges, stuck them to my jacket. In one store room I found red ribbons- awards for the ‘short high jump’ and festooned myself with them. I tried on some skis, skid about a bit. I tried to get into another store room and failed. I sat in the big chair behind the big desk of the once-bossman extraordinaire. It was neat, but like the rest of it, but not really haikyo meat. We left, to seek out the mine. I asked the helicopter guys, and they directed us back up the hill. They warned us that we couldn’t go in, which I took to mean that there would be a fence around it, but it turned out he was warnign me all the mine holes were filled in, which they were. Added to that any proper structures had been demolished, leaving us with only concrete sump-things against scraggy brown hillside, nothing epic or mind-blowing. The climb was bracing, the ascent very steep, but once up there wasn’t much to see or shoot, so we didn’t hang around. The ski lift was almost an afterthought, but was grea fun for what it was. I climbed up the head machine, and up one of the taller support pylons. At the top I got a thrill from vertigo, which was cool, and a nice view. The sun was very sharp though and glare made taking photos quite tricky. Ski lift. 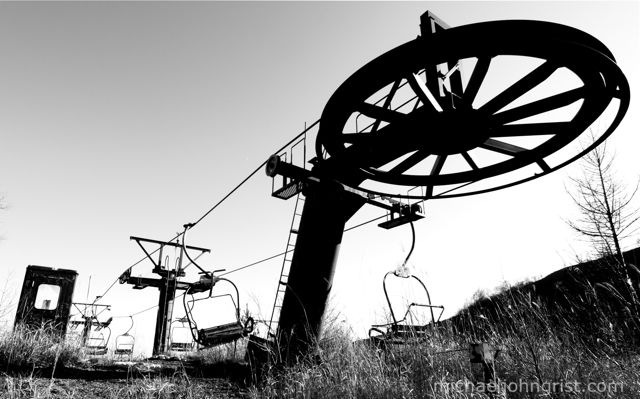 Perhaps the lines will go slack in 10 or 2o years and all the lift-seats will sink to the ground, like worn tire-treads. The world through a loop of lift-seat. Not quite as luxurious as some Chicago hotels or any other sort of hospitable place. Zooming up and down like a roller-coaster. Board from the left, please. Down from the tallest pylon I climbed. Sway, sway. After that we headed off to another mine, one we’ve tried to get to before but failed on an overly icy hill. This time we failed because the road itself was closed for the winter. A toll-road guy turned us around and sent us packing, which is just as well really as we got back to Tokyo barely in time to return the rental car (after maybe 3 hours in traffic, eurgh!). On the whole a great trip, with the two main haikyo still to come- a full-on concrete factory and the piece de resistance, a second pass at the volcano museum. You can see all the haikyo on this site in the Ruins/Haikyo Gallery. That lift looks like it was abandoned mid-season, unless it was one that also operated during the summer months to get hikers to a higher trail. At most ski areas they’ll remove the chairs and store them indoors, so all you’ll see on the mountain is the towers and cable. What’s the location of this ski area? I’d like to poke around and find out what it is, when it closed, all that good stuff. Don’t know why you’d be so blah about this haikyo, it looks like one of the more original ones there are! Seems pretty cool to me, especially since you can climb up the pylons. If the sun was that strong why not, not fight it and go for more silhouette photos like the lead shot, which is an interesting one. Why HDR for every shot still? No video of you skiing? I’d still like to see at least one shot of the scattered boots and skis inside. 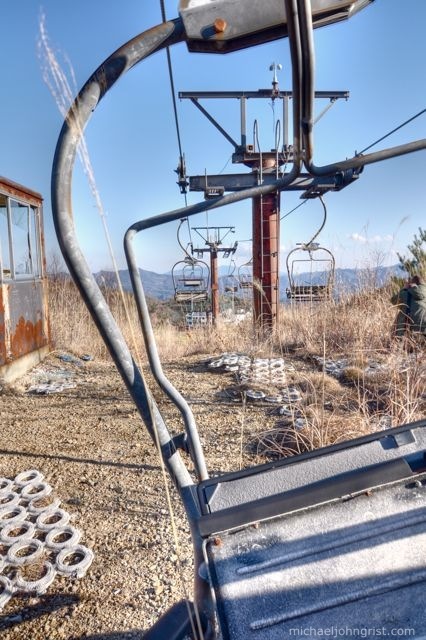 Actually I think this old ski resort is one of the cooler haikyo and really is a classic haikyo. A calssic example of a recreation resort that may have been popular for a short while in Japan’s boom years but now abandoned as the economy and the population shrink. This is a great haikyo. uuuhh, what brought on this bit of prose? Seems a bit negative Mike, I actually had fun here. I’ll admit the inside of the lodge itself was a bit dull, but the hike up the mountain to the mine, plus the great view, fresh air and decent shots of the chairlift more than made it worthwhile to me. Yeah, not a great haikyo, but it was fun nevertheless, albeit in a different way than most places. The chairlift was a big help too, and the top picture of it is especially good. Durf- Ha, I knew there had to be a technical term for them, thanks. Am glad you mentioned the mid-season thing, it does seem a bit strange to leave seats just hanging there like that. I guess it was an abrupt closure. As for some details, I’ll send you an email. Jason- Blahness I dunno, have since amended the post to remove it as it was annoying me too. HDR shots, well, not every photo in the post is HDR. Predominantly HDR though as I make an HDR of every shot, then compare it back to the original. The HDR generally wins out. Tornadoes- Good points, all. The ski lift was great, though offered very little explore. 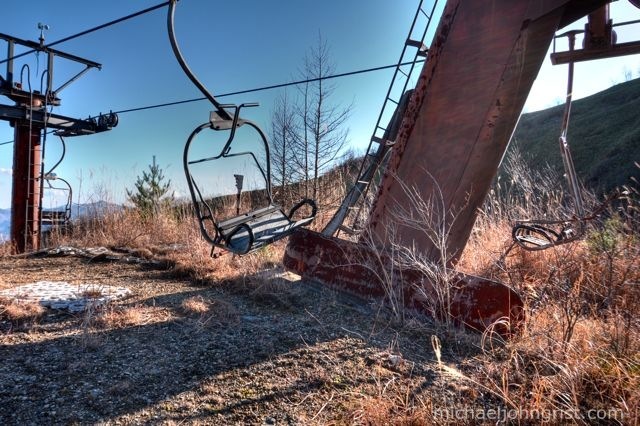 The Ski resort offered things to explore, but nothing much to shoot. Can- I dunno, that phrase just popped into my head and I decided to use it. Now though I see how it pitches the whole post into a kind of complaining tone- which I don’t much like- so I’ve since changed it. I had fun too. It’s true that I was a bit disappointed the mine was not more awesome, but no point going on about it. Better to take it all for what it was. 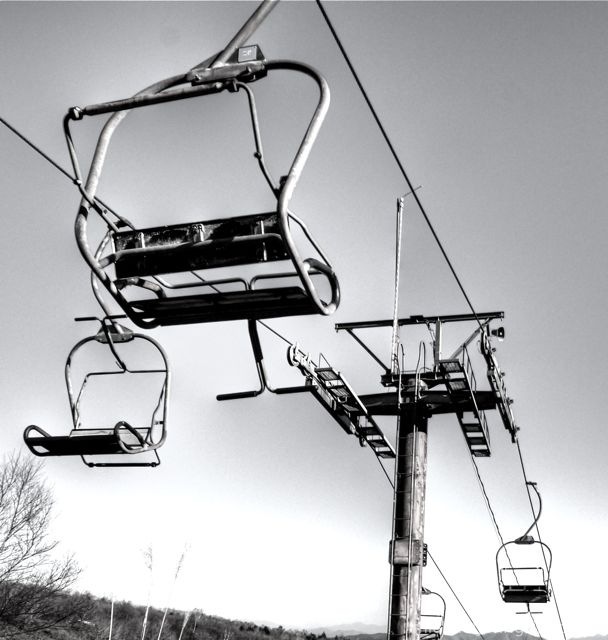 Lee- Agreed, the chairlift was def the best thing for shooting, and yeah it was fun. Thanks for props, is fun to trial things in black and white. In this case black and white probably saved it, as in color the hues and saturations are all weird. Absolutely stunning shots… Love the black and white ones! Very cool shots of a piece of history. I rode on one of these when I visiting a friend in TN. Such a cool ride.